A company in Brazil called Artis Tecnologia has developed medical 3D printing technologies to aid in skull resection surgery. They demonstrated their techniques on a volunteer patient who received surgery for free at the university hospital of the Federal University of São Paulo (UNIFESP). They published an article about it two weeks ago in the International Journal of Computer Assisted Radiology and Surgery. Their technologies allow the removal of a skull tumor and the implantation of a prosthesis in a single surgery. The company works with the doctors to plan the surgery and make the mold for the prosthesis. In this case the company donated the mold and the surgical navigator for the computer assisted surgery (CAS). First, the doctors take a CT scan of the patient, following a specific protocol so that it is precise enough to make the personalized mold. The scans are imported into the company’s EximiusMed software and which is compatible with the surgical navigator. The company is responsible for deciding on the surgery margin, and providing an image of the prosthesis, which is approved by the surgeon. The planning and production of the mold takes four days. The personalized mold is made with Magics software from Materialise, a company from Belgium. They make the mold for the prosthesis as well as a model of the bone fault, with submillimeter precision, using a 3D printer from 3D Systems, which uses layer-by-layer manufacturing in layers 0.16 inches thick. It is made from a plaster-like material, and finished with an insulator on the inside and scratch proof finish on the outside. Then, the mold and bone fault are packed in blister packaging, sealed with Tyvek, and sterilized by ethylene oxide, before shipping. The prosthesis, made from PMMA during surgery, is created using a hand press as shown in the video. The PMMA in plastic phase undergoes a slight contraction, and using 20% extra PMMA and a press, ensures the correct size for the prosthesis. The extra material drains out of the mold and can be easily removed from the prosthesis. The mold also absorbs heat from the exothermic reaction. It is pressed until polymerization is complete which takes ten to twenty minutes. Finally the prosthesis is washed generously with saline solution. The clips are used to stabilize the prosthesis but not hold it in place. 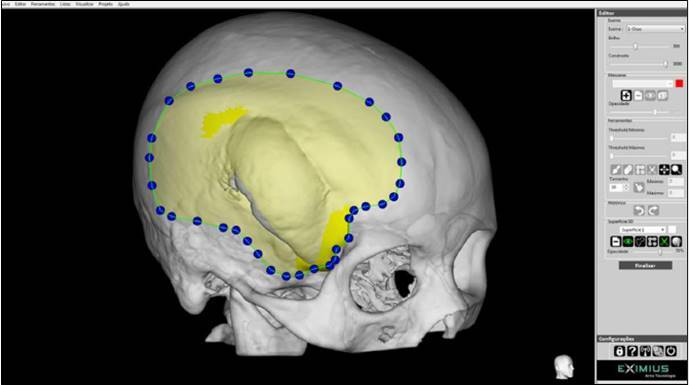 The prosthesis should overlap the edges of the skull fault as shown in the figure so it does not slip into the cranial cavity.